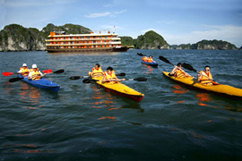 One of the best ways to discover the natural beauty of the bay is onboard Halong Emotion, designed to give you the best service you could possibly wish for. Watch the scenery go by with a nice glass of wine and do as much or as little as you feel like on your holiday. 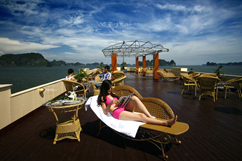 Halong Emotion combines charm and great comfort to meet the growing demand of travellers looking for luxurious cruises in the bay. 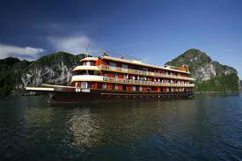 Halong Emotion features 28 air conditioned cabins with private bathrooms and facilities similar to a boutique style hotel, a dining room with sea view, a bar and a superb sundeck. 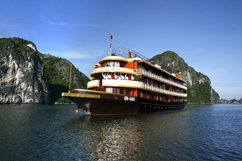 Designed in the 1910’s Indochina style, the Halong Emotion offers the perfect mix in traditional elegance and modern comfort. Special attention has been paid to the decoration and interior of the junk. In line with commitment to offer guests both charm and comfort, Emotion cabins offer a range of facilities and an elegant ambiance. Emotion Cruise has 22 deluxe cabins of 18m2. They are equipped with high standard facilities, response fully to 4 star hotel rooms. 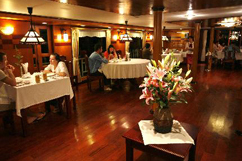 All cabins are open to the sea and have private WC, hot shower and air-conditioning. We design one Suite Cabin with 25m2, in front of the boat in first floor. Fully open to outside and have a specific layout, the Suite cabin gives a spectacular atmosphere. 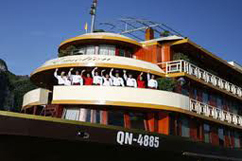 Cabin Facilities: High-quality wooden and bamboo décor, Air –condition, High-quality double bed: 160cm x 200cm, Fresh flowers, In-house Telephone, Mini bar with Drink, Safety box, Special chair and table, wooden wardrobe, Indochina pictures and Safety Equipment and Life Vests. The president cabin is without doubt our best onboard setting. Largest, very comfortable, warmly decorated, luxury WC, fully equipped. This cabin can reply to the most demanding passenger. We have special extra services for President cabin. It is a warm and romantic atmosphere, will be the feeling you have when sitting by overlooking sea view window and being served in our restaurant. 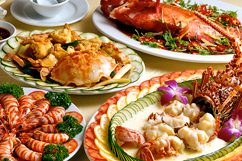 All the dishes are made of fresh materials in the coast. 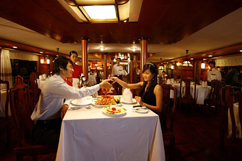 The restaurant is 250 m2, can welcome up to 80 guests. Any taste of wine will be satisfied in the bar, which is located in the sundeck. And it is where you will have chance to watch the profession of our cook in barbecue.